Significant cost savings can be achieved by using technology to deliver training outside the traditional classroom. The large pie chart on the right illustrates the component costs of a hypothetical two-day classroom course delivered to 20 students ten times a year. 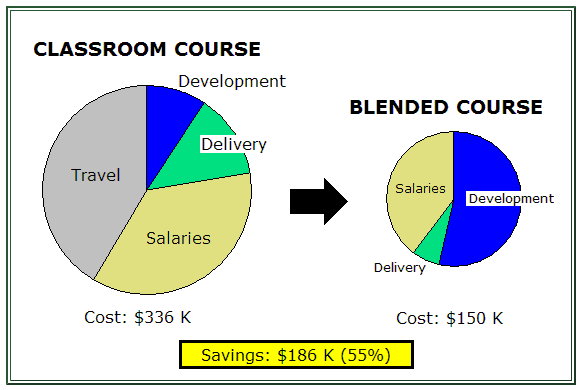 The second, smaller chart illustrates the overall reduction in training costs that can be achieved by using a “blended” delivery approach which involves some online training and less classroom time. Although development costs are often higher for technology-assisted training, these costs are more than offset by the savings in course delivery, student salary costs, and travel. New Approaches – Better Results! a 2-hour virtual class for discussion, interactive exercises, goal setting and wrap-up. In this scenario the cost of course development rises, but since students are able to access the course from their regular offices (or even in their homes) the significant costs of travel and living expenses go away. Also, since considerable time is often lost to travel and since the total time the student spends on the course is reduced from 16 to 12 hours, there is also a significant saving in student salaries. The analysis we have shown here omits one very important cost – the cost of lost business opportunities when your people are in class and out of the field. In the worst case, when it’s your senior executives and your top salespeople, these costs can dwarf some of the other costs cited above. Which makes it even more attractive to use a blended learning approach to minimize the time your people are away from their work. If you would like to save money and time on effective training for your employees, customers, or business partners, contact us today.